"Following in Singapore Air's footsteps as 'the world's largest flying iPod dock,' United announced Monday that it would become the first US airline to offer in-flight iPod and iPhone connectivity. "Beginning today, the carrier will offer the service as part of its in-flight entertainment system, letting users charge and connect their devices to the plane's 15.4-inch personal TVs." "Hillary Clinton broke new ground in her race for the White House. Yet some iPhone users complain that when it comes to the hot gadget from Apple, women are still being treated like second-class citizens. "Apple said this week that on July 11 it would upgrade the iPhone software for free with new features for all current owners. On the same day, it will start selling a new version, the iPhone 3G, that runs on a faster data network, includes GPS and costs as little as $199. "But Erica Watson-Currie of Newport Beach was frustrated that the improvements didn't solve the fingernail problem. She and other women who have long nails - as well as people of all genders with chunky fingers - have real trouble typing on the iPhone...."
"Although Apple has announced the iPhone 3G at the fantastic price of $200, first generation iPhones are still selling strong on eBay. Unlocked 8 GB iPhones are going for about $350 on average, and 16 GB phones for even higher. Why? A couple reasons come to mind...."
"Aaron Vronko of Rapid Repair, which specializes in repairs of iPhones, iPods and other small devices, claims the launch of the iPhone 3G will lead to a brand new market that many are overlooking: sales of first generation iPhones. "He claims this new market birth will be a buzzing hotbed more active than the selling of 2.0 itself. Everything from busted warranties, the sale of damaged devices, carrier interoperability hacking, theft, and other market swirling topics, he claims, will change the face of the used cell phone market." 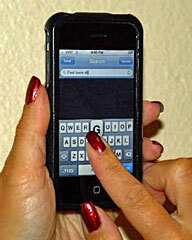 "Despite the imminent release of the iPhone 3G, first-generation iPhone models are still commanding high prices on eBay and other resale venues, indicating concern over the ability to unlock and/or jailbreak the upcoming model combined with significant demand in countries where the iPhone 3G will not initially be on sale, including Russia and China." "According to a survey by iSHARE, 91.0% of Japanese mobile phone users are not planning to purchase Apple Inc's 'iPhone' mobile phone. "Asked if they have a plan to purchase an iPhone, 36 respondents (8.9%) said 'I am planning to purchase one.' Nearly half of these 36 respondents were Softbank Mobile users, iSHARE said. "Respondents who said 'I prefer replaceable batteries' accounted for 77.1%, while those who said 'I don't care if the battery is replaceable or not' made up 22.9%." "Current iPhone owners in the US who are thinking about upgrading to a new iPhone to take advantage of the faster 3G network may wind up paying more for what they already have. "AT&T's 3G coverage map reveals its 3G coverage is spotty, concentrated in major metropolitan areas around the country. We stitched together this map using the coverage tool from AT&T's Web site. The dark blue patches indicate areas where the 3G network is available. For the vast majority of the country - geographically, at least - 3G is unavailable. "That means many new iPhone owners will be paying for 3G speeds they may never see...."
"If you're anything like us, just about everyone in your family has called you up this week to ask if you think they should get the iPhone 3G; it really doesn't help matters that there's just an absurd amount of (mis)information floating around about it right now, too. So this one's for you and your fam - we're dishing out the straight dope on iPhone 3G, a to z, so feel free to pass it on. "So, what's with the new iPhone 3G?" "A 3G cellular telephone network offers something akin to wired broadband while away from a wire, whether you're anchored to a table, walking, or traveling at driving or train speeds. The 3G part refers to the evolution of the cell telephone network." "Now that the dust has settled from Apple's Worldwide Developers Conference, we've had time to answer some of the most pressing questions relating to the iPhone 3G. Steve Jobs unveiled the next version of the popular handset to kick off WWDC, with the new iPhone arriving in Stores on July 11. "Although there are still some things we don't know about the iPhone 3G - and probably won't until we've had some extended face time with the updated phone - here's what we've figured out after talking to AT&T, scouring the Web, and racking our brains." "Apple unveiled its new version of the iPhone with characteristic fanfare Monday, demonstrating download speeds several times as fast as the old version. Unlike its predecessor, the new iPhone uses the '3G' technology already offered by several other carriers. What, exactly, is 3G?" Link: What the Heck is 3G? "Steve Jobs has admitted that recently-acquired PA Semiconductor will be building chips for the iPhone. "Apple acquired PA Semiconductor back in April for a princely $278 million, provoking a flurry of rumours that the company was planning to move into chip design, with new processors for iPhones and iPods mooted. "The rumour was slightly offset with the release of Intel's Atom, with many suggesting the low-power chip could find its way into the iPhone before long." PR: According to a new report from Strategy Analytics, Nokia, Blackberry, and Apple are pioneering fresh revenue streams for the mobile handset industry with their emerging push into value-added services such as navigation, email and music. Current revenues for all three vendors are modest, but growing. "Backpackers are used to dealing without a roof over their heads or indoor plumbing. But they apparently can't live without their cellphones and music players anymore. "But what if you're hiking where it's overcast? The Sidewinder Cell Phone Charger ($24.95) lets you become your own electric turbine. Cranking the little handle for two minutes generates about six minutes of talk time." "The iPhone is a great phone - just as it is. But what if you wanted to use it on another mobile network, where the signal might be stronger or the per minute rates a little lower?. Well, unfortunately, you can't. Unless you "unlock" it. "There are at least two ways to unlock your phone - a hardware modification - which means opening up your phone and making some changes to the circuitry. This is technically difficult to do and should only be undertaken by experts. The other way is to run a software program that will do the work for you." "The iPod touch makes a great e-book reader, with a large, high-resolution screen and touch navigation. You'll need to jailbreak it first (find out how at the Wired How-To Wiki) and install either the free Books application or the $35 i2Reader (both of which are found in the Installer). Any text file can then be loaded up and you simply swipe through the pages. I2Reader also lets you bookmark pages to go back to later. "That's fine, but the little iPod gets uncomfortable to hold after a while, and it lacks the presence of a real book. Imagine seeing an attractive girl (or boy) sitting outside a pavement café, drinking an espresso, smoking a Gauloise and reading a tatty paperback. It's a romantic image which is shattered when you swap the book for a PDA. I decided to disguise my iPod as a book, and if that wasn't pretentious enough, I put it in a modded Moleskine, the notebook of choice for fops and dandies the world over. Follow along to see how it turned out." "One of the new mobile apps that was demoed at last week's WWDC keynote and will be available upon the launch of Apple's new App Store is MLB At Bat, from Major League Baseball Advanced Media. The software, which is making its debut appearance on the iPhone platform, allows baseball fans to get live scores, including a line score and current game status information, and watch video highlights just a few minutes after the events occur, while the game's going on." Just in time for the launch of the third generation iPhone,GolfFlyover.com will have a remarkable 10,000 golf courses full mapped out along with amazing 3D Flyovers. From the tee to the green, the new golf course flyovers and layouts give iPhone users an in-depth view of all holes by displaying the distance and layout in order to accurately measure and plan shots. All course information is provided free of charge with no membership needed to view the courses. GolfFlyover is creating hundreds of new flyovers every week. In just a few months GolfFlyover expects to have every golf course in America fully mapped out. That is more than 18,000 courses. Also new to GolfFlyover is their Google Earth 3D plugin for the web browser. GolfFlyover is one of the pioneering companies to take full advantage of this new plugin technology from Google. Downloading and installing Google Earth is a thing of the past. Simply visit their flyover web page and install a Google's simple plugin and take full advantage of all Google Earth features inside your web browser. In addition to the new flyover feature, GolfFlyover.com offers information on the country's top golf destinations, the PGA Tour, vacation packages, international golf homes, and much more. Visitors can get advice and information on planning a golf vacation around some of the world's top courses. GolfFlyover, LLC, located in Millersville, Maryland, is dedicated to mapping out every hole of every golf course in the entire world. PR: Expressivo 1.4 - the latest version of the software that reads books with a beautiful voice - has been launched. Buying the software with the English-speaking voice of Jennifer you also receive a free collection of 50 popular e-books in English. The free collection of e-books - supplied with the version of Expressivo which speaks American English with the voice of Jennifer - includes 50 of the most popular literary works of the world made available as part of the Project Gutenberg. Users of Expressivo have free access to a collection of books including Jane Austen's "Pride and Prejudice", James Joyce's "Ulysses" or Mark Twain's "Adventures of Huckleberry Finn". Additionally at www.expressivo.com you can download, free of charge, other e-books and then play them on your computer or save them as MP3 files and then play them e.g. on an iPod. Such an MP3book can be a perfect, eye-friendly entertainment during long holiday travels. The new Expressivo also comes with an enhanced feature of converting text files into sound. With Expressivo 1.4 you can convert any text file into an MP3 file even 50 percent faster than with the previous version of the application. Apart from the voices embedded in the software you can also add any other text-to-speech reader to Expressivo and enjoy the voices it generates in other languages. Up to now Expressivo could read only texts written in the Latin alphabet. This has changed in the 1.4 version as the application has been adapted to the international character encoding system, UNICODE. Now after adding the appropriate text-to-speech reader to the application, Expressivo can read texts written in any language of the world, including Arabic, Russian, Japanese or Chinese. Expressivo 1.4's other new attractive features include the new clock-reminder compatible with the Google Calendar! Clock-reminder will also read out the events planned in the calendar of your email application (e.g. MS Outlook, Mozilla Thunderbird). Expressivo is a computer application for anyone which can read any text with a human voice. It may also be used to facilitate learning of foreign languages or to read out film subtitles. Expressivo allows you also to listen to books, RSS feeds, Web pages, e-mails - not only via a computer but also via a portable MP3 player, such as iPod or iPhone. With Expressivo you can also easily create audiobooks. The affordable price makes it possible for virtually anyone to enjoy the text-to-speech technology with Expressivo. Expressivo sells for $49 and requires Windows 2000, XP, or Vista. PR: When It's About Time to Learn iPhone shows you how to do something on iPhone, you can then instantly try it on the virtual iPhone that is built into the learning tool - an interactive experience unique to "It's About Time Products." "It's About Time to learn iPhone" is an intuitive learning tool. Instead of having a long index, like the back of a manual, our learning tool features Click to Learn - Just click any button and Saied, your instructor, will teach it to you. Want to learn about Safari? Just click it. In addition, after you have finished a lesson, a gold star is added to the left of the button to let you know you've completed that lesson. The future of learning meets the future of phones. "It's About Time to learn iPhone" is one of the most amazing learning tools anyone has ever created. When Saied, your instructor, shows you how to do something on iPhone, you can then instantly try it on the virtual iPhone that is built into the learning tool - an interactive experience unique to "It's About Time Products." From setting it up in iTunes, to using every iPhone application, to helpful tips and tricks - you can become an expert and use iPhone to its full potential. We think people learn better by trying it out for themselves, not by reading a 300 page manual. PR: Go solar and use the sun to re-power your portable electronics with the Solio H1000 from Better Energy. The highly efficient solar cells generate power from natural sunlight, charging an internal battery that can then be used to charge and use your mobile devices when far from home and an outlet. Solio which won the prestigious 'Best of Show' Award at its launch in the 2005 Macworld Expo, has been a resounding success around the world and has enabled Better Energy to demonstrate that efficient, well-designed and environmentally aware products can be a commercial success. The innovative Solio can be used for all your on-the-go charging needs, whether that be your cell phone, iPod, PDA, camera or other handheld device thanks to an intelligent interchangeable tip system. This universal hybrid solar charger generates energy from sunlight then stores it within its integrated Lithium Ion battery up to a year! A one of a kind pioneering concept in eco-mobility, the hybrid nature of Solio comes from being able to plug it into the wall for charging at night or on cloudy days. It fits comfortably into a pocket, making it a perfect power solution whether for your daily commute or adventure into the wild. Not only practical but also a high fashion item, Solio is designed to do its job wherever you are, whenever you need it and what's more, it looks great. Available in four colors, the Solio Universal Hybrid Charger retails at $99.95, including six tips and cables for a variety of cellphones, iPods/MP3 players, PDAs, game players, cameras and many more devices and a global travel adapter. For a full range of Better Energy products and details of retailers go to solio.com. 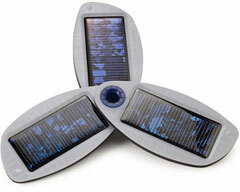 PR: This universal solar charger keeps virtually all handheld electronics topped off with free solar power anywhere. Package includes: Solio charger, universal 12-volt wall adapter; four international wall-socket adapter plugs (US, UK, EU, AU-NZ), window suction-mount, cell phone adapter plugs (Samsung, Motorola, Nokia, mini-USB), universal cable, female standard USB adapter (powers iPod) and instruction manual. Following the huge success of Proporta's Mobile Device Charger, the clever chaps at Ted Baker got wind of what a great product Proporta had come up with, and asked if they wouldn't mind making a Ted Baker version in stylish two-tone brown. Not being ones to disappoint Proporta gladly obliged and have given their award-winning Mobile Device Charger a new suit and added loads of handy accessories. Introducing the Ted Baker Six Pack. This ridiculously handy product can be charged from any standard USB port and stores an impressive 3400 mAh of power for when you need it most. Ted's Six Pack includes an AC World Travel Charger Kit, allowing you to charge your device from wall current wherever you are in the world or from your car, a retractable cable to marry it all together, and a whole host of popular connector heads making it compatible with all current iPods, as well as many leading mobile phones (including Ted Baker's own) and numerous USB powered digital cameras. Phew. With Ted's Six Pack you need never run out of power again. Simply keep everything in its beautiful drawstring bag and the next time your device's battery runs dangerously low, you can recharge it anytime, anywhere. Ted's Six Pack is powered by the award winning Mobile Device Charger and includes all you need to keep your mobile devices charged and at the ready whilst on the move. This ridiculously handy product charges from any standard USB port and stores an impressive 3400 mAh of power for when you need it most. Plug any USB powered mobile device (phone, iPod, digital camera etc.) into the battery's standard USB port and recharge anywhere. Even power hungry devices will recharge and last for up to three times longer when connected to the Mobile Device Charger (USB Rechargeable Battery) and you can recharge your mobile, Smartphone or PDA anywhere. Use as an emergency charger which can be recharged from any convenient USB port and never run out of power again. The TSP includes a USB to Mini USB cable, and a retractable cable which is compatible with the following interchangeable connector heads: 1 x Nokia - Universal , 1 x Sony Ericsson - Universal, 1 x iPod, 1 x Samsung (suitable for use with Ted Baker Samsung phone) 1 x Mini USB (suitable for use with Ted Baker Needle phone), 1 x Micro USB, 1 x 4.0 DC. If you need another connector for your device, check our selection of connector heads , where you can get one for free with your charger. To make this charging kit truly universal, the Ted Baker Six Pack also includes a useful in Car Power Supply compatible with all standard car cigarette lighter sockets, as well as an AC World Travel Charger Kit which will allow you to charge your device and battery from the mains, wherever you are in the world. To complete the kit, Proporta and Ted Baker have included a beautiful drawstring bag to keep everything safe and sound. How many times can I charge my device with this product? The short answer is, with a fully charged Ted Baker Mobile Device Charger, you should be able to charge most mobile devices between three and five times from completely empty. This is a significant improvement over traditional 'emergency chargers' and you should remember that your battery is rarely completely empty so it's likely that you'll get even more out of it. For more information, please click here. Note: The Ted Baker Six Pack is not compatible with the Microsoft Zune, Dell Axim, or Asus Eee PC. Keep an eye on Proporta's store for future Proporta and Ted Baker product collaborations. P.S. Want the power of Ted, but without the AC World Travel Charger Kit? 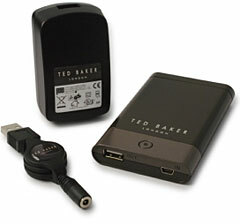 Check out Ted's No Ordinary Designer Charging Kit: - $49.95. PR: Monster has announced that the iCarPlay 250 wireless FM transmitter is now shipping. The iCarPlay Wireless 250 allows music lovers to transmit music wirelessly via their iPhone or iPod® through any FM radio station. It offers users an affordable wireless solution for enhancing and expanding their MP3 listening enjoyment. "Monster has always been the leader in FM transmitters," said Noel Lee, The Head Monster. "Monster was the first to design a model that far outperformed the competition in terms of sturdiness and reliability. We were also the first to design an FM transmitter with a built-in iPod charger, and the first with AutoScan capability. And we've raised the bar yet again with iCarPlay Wireless 250 - the world's most innovative, high-performance FM transmitter for iPhone and iPod." The Monster iCarPlay Wireless 250 lets anyone enjoy their music on their car's FM stereo system while simultaneously charging their iPhone or iPod. This ensures that power depletion during long road trips will be a thing of the past for iCarPlay Wireless 250 users, whose iPhones and iPods will always have plenty of power upon arrival! Another great feature is the flexible use options for the iCarPlay Wireless 250. The FM Transmitter can be used both in the car and in the home/office. Simply unplug the USB cord from the Cigarette Lighter Adapter (CLA) and then power the iCarPlay Wireless 250 from any standard powered USB port or via a Monster iSlimCharger® or iCharger Travel® USB wall charger. Additionally when the iCarPlay Wireless 250 is not in use in the car, that same CLA with the USB plug can be used to power other electronic devices designed to charge via a USB connection. Simply use the charging cable that was supplied with that device along with the iCarPlayWireless 250's CLA plug, and don't worry about having to carry along multiple chargers. The Monster iCarPlay Wireless 250 employs a variety of breakthrough technologies to achieve a new level of performance and convenience in wireless iPod transmission. Noted Mr. Lee: "With other wireless transmitters, you need to hunt for an FM channel that's clear enough to tune into. The Monster iCarPlay Wireless 250 features new Monster AutoScan 3D technology that automatically scans the entire FM spectrum three times to lock onto the clearest FM frequency available. This ensures better signal transmission than other wireless transmitters that scan only once. In addition, the iCarPlay Wireless 250 outputs a line-level audio signal for full-range dynamic sound with minimal distortion for an incredible listening experience that many FM transmitters simply can't match. New advanced digital technologies automatically adjust power output on individual frequencies for maximum signal strength. The iCarPlay Wireless 250 is the ultimate iPhone and iPod car companion. PR: iHome, a division of SDI Technologies and leading worldwide manufacturer of iPod and iPhone accessories, has announced the iH69 and iH70, innovative new speaker systems for Macs and PCs. Now, iPod users can dock, charge, play and sync their iPods directly to their computer via their speakers, providing better quality sound and functionality with no extra wires, cables or space necessary. "At iHome we continually strive to provide innovative products for iPod owners that enhance their listening enjoyment and maximize the functionality of their iPod," said Evan Stein, Vice President of Marketing, iHome. "The new iH69 and iH70 are a perfect marriage of sound and design, and with their charging and sync capabilities, they are the ideal, all-in-one speaker solutions for the Mac or PC that will consolidate space and bring iHome's advanced sound technology from audio speakers to computer speakers." Compatible with all docking iPod models, the iH69 and iH70 conveniently charge, play and sync iPods while they are docked securely into the base of the computer speaker. The iH69 and iH70 are designed with high-fidelity Reson8™ speaker chambers providing the listener with premium power output, computer port, sync switch, volume controls and headphone jack for private listening. The iH70 builds upon this base with higher wattage producing speakers, a full functioning remote control and the inclusion of SRS® WOW sound enhancement technology that expands the audio field for a richer sound experience. The iH69 and iH70 is currently available for pre-order on iHomeaudio.com and will be available soon at major retail outlets nationwide for the suggested retail price of $99.99 and $129.99 respectively. PR: Momail is ready for the new "supermobiles" from Apple and Samsung launched June 9th. Total number of devices supported for its mobile email service has now surpassed 1100 different models, making Momail the outstanding leader in device support for mobile email. Momail is again first to offer support for the latest, and long awaited, mobile devices, this time from Apple and Samsung. As the handset specifications were officially released after the companies' respective launches on June 9th, Momail can confirm support for the new iPhone 3G and the Omnia. "These devices will sell large volumes, and their specifications makes them very suitable for consumer mobile email and Momail. Our server based solution gives us the possibility to add support for new devices very fast and today we support over 80 percent of devices shipped. So, with Momail, iPhone and Omnia users will soon be able to enjoy the world's smallest, smartest, and most cost-effective mobile email, says Roger Grönberg, CEO of Momail. Ease of use - Momail is very easy to start and to use, and there is no need for special client software or downloads. All email and data settings are automatically configured by Momail. Fast and data efficient - Momail's patented MMOPE-technology (Mobile Message Optimization & Protection Engine) optimizes all emails, including attachments, per mobile model saving up to 99,9% of the data sent to the mobile device. No tolerance of spam - Included in the service is world class mobile spam and virus protection (IronPort). Your mobile postman - With Momail, all emails can be collected and read from one inbox on the mobile phone (Gmail, Hotmail, Yahoo! Mail, etc.). This feature provides consumers with simple control and easy handling of their email accounts. Momail have already launched support for a number of other "super mobiles" which will soon be on the market, including the HTC Touch Diamond, LG Secret, Nokia N96, and Sony Ericsson Xperia X1. Momail is focused on offering a free and global e-mail service for mobile devices. Through patent pending in-house developed technology, Momail makes a reality of optimal mobile communication for all mobile devices. Via a growing network of partners offering mobile services based on Momail's products and technology, Momail's vision is for mobile email communication to be synonymous with - Momail. PR: Marware Inc announces the Sport Grip for the iPhone 3G. The Sport Grip is consistently one of the top-rated skin cases for Apple products, offering direct access to all iPhone features including display, camera lens, dock connector, headphone minijack, speaker, and microphone. The Sport Grip feels great, looks great, and is available in a variety of rich colors. 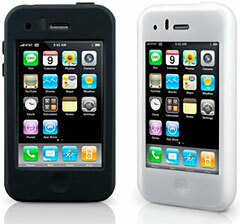 The Sport Grip for the Apple iPhone 3G is available in black, white, clear, and pink. It retails for $19.99 and is available now for pre-order online (shipping prior to July 1, 2008). Please visit the Marware website for updated shipping dates. Marware is a leading provider of case solutions for Apple iPhones, iPods, Notebooks, and Software. 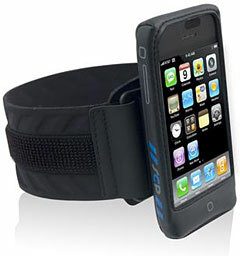 PR: Marware Inc, announces the Sportsuit Convertible for the iPhone 3G. The Convertible includes one of the finest and most comfortable armband designs on the market, and as an added bonus provides a removable armband pouch that you can conveniently slip cash or keys into while you are out for a jog or jaunt around the neighborhood. The Convertible's neoprene skin and durable vinyl screen-cover completely enclose and protect your iPhone while giving you full usage of all screen functionality and buttons. The Sportsuit Convertible is available in black neoprene. It retails for $34.99 and is available now for pre-order online (shipping prior to July 1, 2008). Please visit www.marware.com for updated shipping dates. Marware is a leading provider of case solutions for Apple iPhones, iPods, Notebooks, and Software.